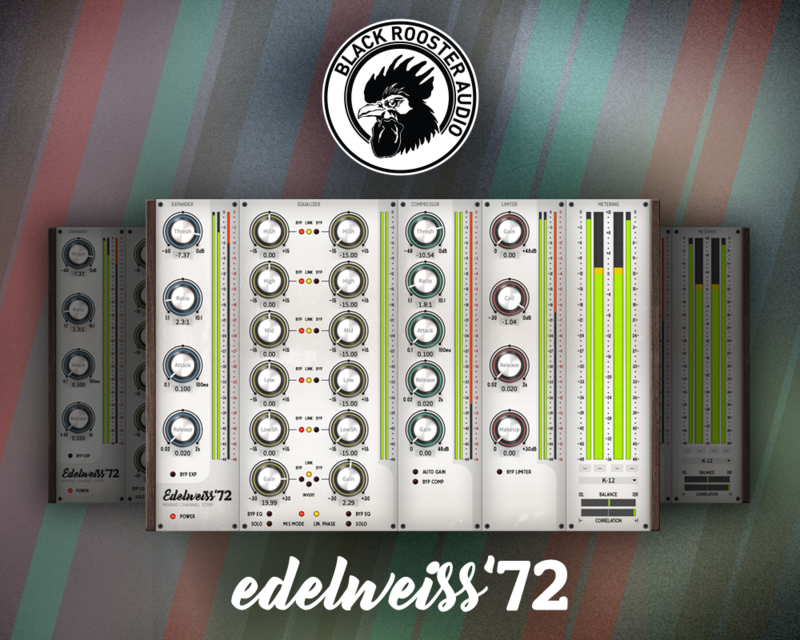 Black Rooster Audio is excited to announce the Edelweiss‘72, a highly dynamic mixing toolchain, that allows surgical modifications to any signal or mix that might sound limply, needs subtle tweaking or a decent finish. Where in the input stage you are able to expand the signal, that might be stressed by over-compression or needs a wider dynamic range, you can EQ your signals in 5 static bands, with linear-phase filters in regular stereo or M/S mode. A final compression/limiting stage will finish the overall process with a concentration of density made up with (auto) gain-stages at the end of each section. We focussed on a variety of process-friendly bypass and soloing options, as well as proper K- and peak, balance and correlation metering in order to concede decent comparison workflows. All our plugins can be tested within an individual 14-day trial period. We are very much looking forward to this release and hope you will enjoy this tool as much as we do. Edelweiss`72 will be released very soon. Please stay tuned.